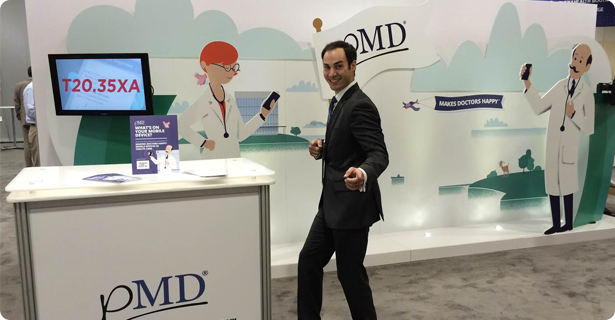 The pMD team just wrapped up the athenahealth User Conference 2014 in Boston where we debuted our new booth, gave away fun prizes, and met a lot of great people in health care. I wrote about the importance of booth activities and prizes here in the charge capture blog, and this conference has put all of that into practice. Our booth was the centerpiece of our presence at the health care conference. 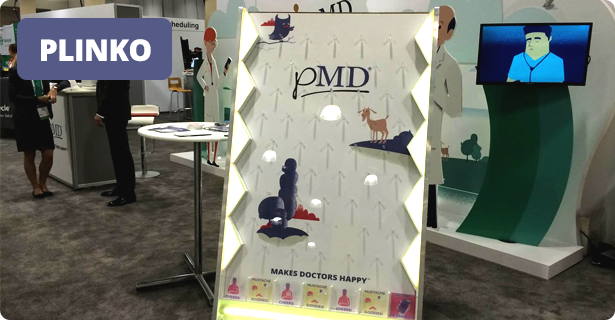 When we created our booth, we worked with DisplayWorks, an exhibit design company that incorporated our company’s personality and branding into the essence of the booth. Our objective was to create a really unique booth that was unlike anything we’d seen before. That objective was met with flying colors (and flying birds & planes with mustaches), and the reception we got around the booth was fantastic. The Plinko game at the booth also deserves credit for the success of this conference for us. With its flashing lights and cheering winners, we often had a line up of people waiting to play. The mini Patron bottles, chocolate mustaches, and mustache stickers were a big hit. We also had one prize slot that was one free year of secure text messaging. The value of this prize was way higher than the other prizes, and although some people might have preferred to win the tequila, it was a great draw for many health care practices. Now we’re off to get some sleep after a fast-paced, full conference, and dream of mustaches, tequila, and mobile charge capture!